Combining swimming, cycling and running, Triathlon is a true test of fitness, tactics and endurance. Athletes jostle for position in the open water, transition to the bike for an arduous cycling leg, then it’s into running shoes for the final gripping leg to the finish line. Triathlon at the Gold Coast 2018 Commonwealth Games will see athletes racing for glory in Individual and Para Triathlon events as well as the Mixed Team Relay. Get all the latest on Triathlon. This event is one of four GC2018 gold medal events that will be free to the public. These events will give everyone the chance to Share the Dream by lining the streets to catch the exciting and fast-paced action of a world-class international sporting event without a cost. Featuring a stunning natural landscape, the Southport Broadwater Parklands is a place to connect, energise and relax in the heart of the Gold Coast’s CBD. In April 2018, the parklands and Broadwater will be put on the world stage, hosting the start and finish of the GC2018 Athletics – Marathon and Triathlon events. Start Mitchell Park, head west, Right onto Gold Coast Highway, Right onto Marine Parade, head north, Right onto Gold Coast Highway, Right onto Marine Parade, head north, Right onto Bayview Street, Left U-Turn at Broadwater Street (4.4km), the northern turn point, head south on Bayview St, Left onto Marine Parade, head south. Left onto Gold Coast Highway, continue south past the Southport Broadwater Parklands and over the Southport Bridge, Left onto Waterways Drive, Right onto Main Beach Parade, continue south along Main Beach Parade, Left onto Higman Street, Right onto Esplanade, head south, continue south onto Northcliffe Terrace and Garfield Terrace, Right onto Fern Street, Left onto Old Burleigh Road. Left onto Armrick Avenue, Right onto Broadbeach Boulevard, Right onto Queensland Avenue, Left onto Old Burleigh Road, head south, continue south onto Hedges Avenue, continue south onto Albatross Avenue, continue south onto Marine Parade, Right onto Hythe Street, Left onto Gold Coast Highway, Left onto Kratzmann Avenue, Right onto The Esplanade, head south. Left into Justins Park car park, the southern turn point (25.3km), Right onto The Esplanade, head north, Left onto Kelly Avenue, Right onto Gold Coast Highway, Right on Hythe Street, Left onto Marine Parade, continue north onto Albatross Avenue, continue north onto Hedges Avenue, continue north onto Old Burleigh Road, Right onto Queensland Avenue, Left onto Broadbeach Boulevard, Left onto First Avenue, Right onto Old Burleigh Road, head north. Right onto Fern Street, Left onto Garfield Terrace, continue north onto Northcliffe Terrace and Esplanade, continue north onto Main Beach Parade, head north, continue north onto Macarthur Parade, Left onto Waterways Drive, Right onto Gold Coast Highway and over the Southport Bridge, continue north past the Southport Broadwater Parklands, Right into Mitchell Park to the Finish. When are the Marathon races? The Marathon races will be held on Sunday 15 April. The men’s and women’s T54 Wheelchair Marathon will start at 6:10am, the women’s Marathon at 7:20am and the men’s Marathon at 8:15am. The Marathon course starts and finishes at the Southport Broadwater Parklands. 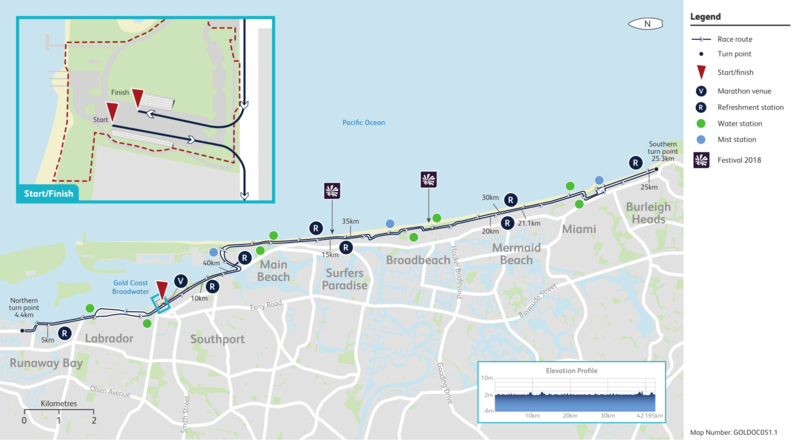 The 42.195km course will take runners to a northern turn at Runaway Bay (4.4km), a loop back past the Southport Broadwater Parklands to a southern turn at Burleigh Heads (25.3km), before a final stretch north to the finish line. How can spectators see the Marathon? The Marathon will be a free event for spectators. This is an amazing opportunity for residents and visitors to watch world class athletes in action from Runaway Bay in the north to Burleigh Heads in the south. Walking or cycling will be the easiest way for spectators to access a viewing position along the course. A guide for the Marathon will be available in the lead up to the Games, and information will be available on the official GC2018 App as well as the GC2018 website. Where is the best place to watch the Marathon? Spectators will be able to line almost the entire course which will create an amazing atmosphere. There will be great vantage points in the parks and public spaces that adjoin the course from Runaway Bay in the north to Burleigh Heads in the south. The Marathon course includes Runaway Bay, Biggera Waters, Labrador, Southport, Main Beach, Surfers Paradise, Broadbeach, Mermaid Beach, Nobby Beach, Miami and Burleigh Heads. A guide for the Marathon will be available in the lead up to GC2018, and information will be available on the official GC2018 App as well as the GC2018 website. How can spectators get to the Marathon course? Walking or cycling will be the best way for most spectators to find a viewing position along the Marathon course. A guide for the Marathon will be available in the lead up to the Games which will include all travel options, and information will be available on the official GC2018 App as well as the GC2018 website. Will the course be fenced? Our top priority is to ensure the safety of athletes, officials, spectators and residents. Temporary barriers and fencing will be required to secure sections of the course. Will transport and traffic be different? Yes. To ensure the safety and security of athletes, officials, spectators and residents, there will be changes to the road network during the Marathon. We’re working closely with the City of Gold Coast, Queensland Police Service and the Department of Transport and Main Roads to ensure this world class event can be carried out safely while minimising the inconvenience to local residents and businesses. A comprehensive public awareness program called Get Set for the Games is working to ensure the Gold Coast community is kept up to date with event-related information as it becomes available. For more information visit the Get Set for the Games website or contact the team on email or phone 1300 GOLDCOAST (1300 465 326). Can I access the whole course? In some locations we will need to limit access to certain roads close to the course. A comprehensive public awareness program called Get Set for the Games is being rolled out to ensure residents and businesses know how they can access certain areas at Games time. For more information, visit the Get Set for the Games website or contact the team on email or phone 1300 GOLDCOAST (1300 465 326). What if there is a medical or other emergency? We are working closely with the Queensland Police Service, Queensland Ambulance Service and Queensland Fire and Emergency Services to ensure that emergency services have access to all areas. Will my local bus stop move? Public transport is a big part of GC2018 planning. There will be changes to local bus routes and stops. This information will be provided to commuters, local businesses and residents well in advance of GC2018. A comprehensive public awareness program called Get Set for the Games is being rolled out to ensure residents and businesses have information available about temporary changes at Games time. This is a fantastic opportunity for you to be a spectator along this beautiful course, taking in this free, world-class Marathon in your own backyard. A comprehensive public awareness program called Get Set for the Games aimed at ensuring all Gold Coast residents, businesses and visitors are ready to embrace the once-in-a-lifetime opportunity of hosting a Commonwealth Games. The Get Set team is supporting the local community to make necessary arrangements and plan ahead to work around temporary changes in the lead up to and during the event. As new information is released, the website will be updated with the latest information and the Get Set team will provide information to residents and businesses via a range of communication and engagement activities. Swim – 750m 1 lap course (anti clockwise). Start on Swim Pontoon within Broadwater. Swim north 375m, turn left heading west for 50m, turn left heading south for 295m, turn right heading west up the swim exit ramp towards Transition 1. Bike – 20km over 4 lap course (clockwise). Exit Transition 1 and enter the bike course. Turn right heading north along Gold Coast Highway, turn right into Robert Street for a short turnaround prior to Marine Parade and back onto Gold Coast Highway, continue north and turn right into Whiting St, turn left into Marine Parade, turn left into Imperial Parade for a short turnaround at Labrador Street and back to Marine Parade, continue on Marine Parade, turn right into Marine Parade Boat Ramp carpark for turnaround, head south along Marine Parade, turn left onto Gold Coast Highway southbound, turn left into venue and turnaround at eastern end opposite transition to start next lap. Complete 4 laps and return into Transition 2. Run – 5km over 2 lap course (anti clockwise). Exit Transition 2 and enter the run course. Turn right heading north along Gold Coast Highway, turnaround prior to Central St and head back south. Turn left into venue, run to eastern end turnaround and run back through transition to start next lap. Complete 2 laps before entering finish line. Swim – 750m 1 lap course (anti clockwise). Start in water in front of Swim Pontoon within Broadwater. Swim north 375m, turn left heading west for 50m, turn left heading south for 295m, turn right heading west up the swim exit ramp towards pre transition and Transition 1. Bike – 20km over 5 lap course (clockwise). Exit Transition 1 and enter the bike course. Turn right heading north along Gold Coast Highway, turn right into Whiting St, turn left into Marine Parade, turnaround on Marine Parade prior to Marine Parade Boat Ramp carpark, head south along Marine Parade, turn left onto Gold Coast Highway southbound, turn left into venue and turnaround at eastern end opposite transition to start next lap. Complete 5 laps and return into Transition 2. Run – 5km over 3 lap course (anti clockwise). Exit Transition 2 and enter the run course. Turn right heading north along Gold Coast Highway, turnaround prior to Robert St and head back south. Turn left into venue, run to eastern end turnaround and run back through transition to start next lap. Complete 3 laps before entering finish line. Swim – 250m 1 lap course (anti clockwise). First swimmer to Start on Swim Pontoon within Broadwater. Swim north 130m, turn left heading west for 45m, turn left heading south for 40m, turn right heading west up the swim exit ramp towards Transition 1. Bike – 7km over 2 lap course (clockwise). Exit Transition 1 and enter the bike course. Turn right heading north along Gold Coast Highway, turn right into Robert Street for a short turnaround prior to Marine Parade and back onto Gold Coast Highway, continue north and turn right into Central Street, turn left into Marine Parade, turnaround on Marine Parade prior to Whiting Street, head south along Marine Parade, turn left onto Gold Coast Highway southbound, turn left into venue and turnaround at eastern end opposite transition to start next lap. Complete 2 laps and return into Transition 2. Run – 1.5km over 1 lap course (anti clockwise). Exit Transition 2 and enter the run course. Turn right heading north along Gold Coast Highway, turnaround north of Marine Parade intersection on Gold Coast Highway and head back south. Turn left into venue, run past transition towards relay zone. Athlete 1,2,3 all run to the relay zone. Athlete 4 runs directly home to the finish line. Relay Zone – All mixed team relay athletes (4) complete the swim, bike and run course once each. Athlete 2,3 and 4 run directly from the relay zone, back down the swim exit ramp and into the water to commence the swim again. When are the Triathlon races? The Triathlon races will be held on Thursday 5 April and Saturday 7 April. The Individual Triathlon will be held on 5 April with the Para Triathlon and Mixed Team Relay to be held on 7 April. Thursday 5 April is the first day of sports competition at GC2018, with the women’s Triathlon having the honour of being the first medal event at the Games. What is the course for the Triathlon? 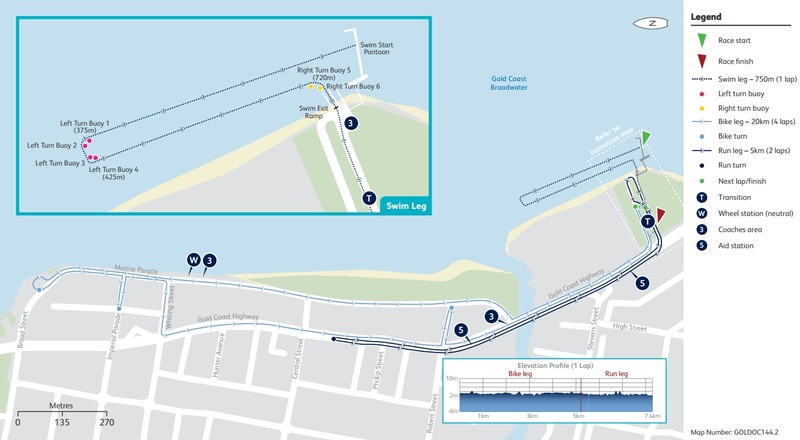 The start, finish and transitions for the Triathlon will be located at the northern end of the Southport Broadwater Parklands. A sprint course for the Triathlon will be used for the first time at a Commonwealth Games. Download course map - PDF. 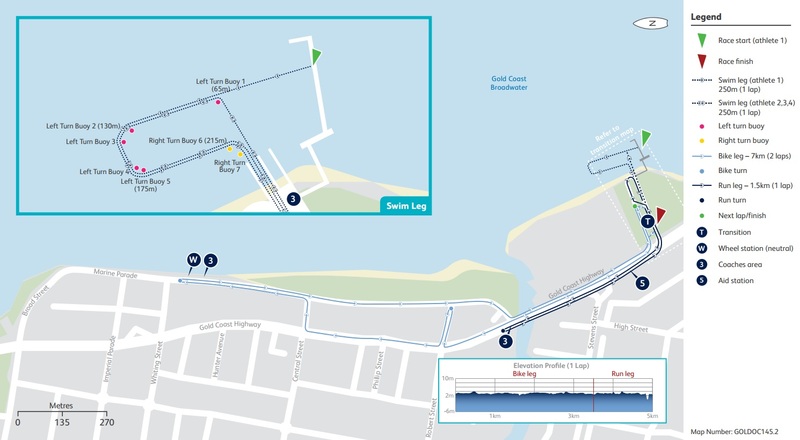 The course will feature a 750m swim leg, 20km bike leg and a 5km run leg. The 750m swim leg will commence from a start pontoon on the Broadwater with an anticlockwise course bringing the athletes into the transition area. The 20km bike leg will consist of a four-lap technical course which stretches from Southport North to Biggera Waters and back. 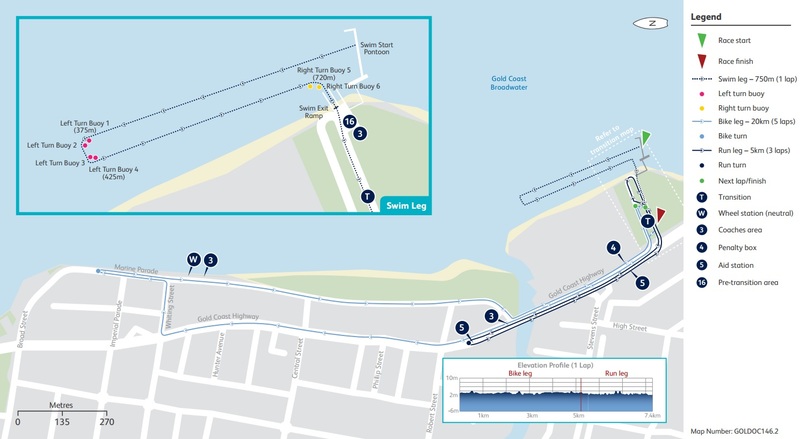 The 5km run leg will consist of two 2.5km laps of a flat and fast course between Southport and Labrador. What is the course for the Para Triathlon? The Para Triathlon course will be similar to the Individual Triathlon except will feature a five-lap bike leg instead of four. Download course map - PDF. What is the format for the Mixed Team Relay? The Mixed Team Relay will feature teams of four racing in the order of female, male, female, male. Each team member will complete a 250m swim, 7km bike and 1.5km run course and then tag their next team member into the race. Download course map - PDF. Why is the Triathlon using a sprint format? A sprint course for the Triathlon will be used for the first time at a Commonwealth Games. The course will feature a 750m swim leg, 20km bike leg and a 5km run leg. This sprint distance replaces the Olympic distance (1.5km swim, 40km bike and 10km run) which has been used at previous Commonwealth Games. How can spectators see the Triathlon? Tickets to view the Triathlon at the Southport Broadwater Parklands venue are currently exhausted. There are free vantage points accessible to the public along the exciting bike and run legs. A guide for the Triathlon will be available in the lead up to the Games, and information will be available on the official GC2018 App as well as the GC2018 website. Where is the best place to watch the Triathlon? The parkland which lines the Broadwater in Labrador and Biggera Waters will provide great vantage points for the bike and run legs of the Triathlon. A guide for the Triathlon will be available in the lead up to GC2018, and information will be available on the official GC2018 App as well as the GC2018 website. How can spectators get to the Triathlon course? Walking or cycling will be the best way for spectators to find a viewing position along the Triathlon course or to get to the ticketed venue at the Southport Broadwater Parklands. A guide for the Triathlon will be available in the lead up to the Games which will include all travel options, and information will be available on the official GC2018 App as well as the GC2018 website. The ticketed venue at the Southport Broadwater Parklands will be fenced with access via official venue entry gates. Yes. To ensure the safety and security of athletes, officials, spectators and residents, there will be changes to the road network in the lead up to, during and after the Triathlon events. A comprehensive public awareness program called Get Set for the Games is working to ensure the Gold Coast community is kept up-to-date with event-related information as it becomes available. Detailed information will be provided well in advance of the event to ensure local residents and businesses are aware of changes to road operations. Businesses affected by road changes can also attend free Travel Advice for Business workshops. Can I access roads close to the course? In some locations we will need to limit access to certain roads close to the course. More information about road closures and duration will be available in early 2018 on getsetforthegames.com. Public transport is a big part of GC2018 planning. There will be changes to some local bus routes and stops. This information will be provided to commuters, local businesses and residents well in advance of GC2018. This is a fantastic opportunity for you to be a spectator along this beautiful course, taking in the free, world-class Triathlon races in your own backyard.